Rockdale Lady's Vintage Clothing Display at the Rockdale Depot Museum. This display was presented by the Rockdale Historical Society with the assistance of the ladies of Rockdale. In the interest of preserving Rockdale's rich past, the Historical Society is actively seeking donations of old photos, letters, and historical relics relating to the Rockdale area. These donations are at the heart of preserving our rich heritage. All donated items will be carefully inventoried, documented, donors identified and recorded and the artifacts will be integrated into wonderful displays of Rockdale's early history. To make a donation, contact any of the Rockdale Historical Society board members or come by the Depot Museum during open hours (Saturdays 10-4 and Sundays 1-4 or call ahead for a special appointment-PHONE No. 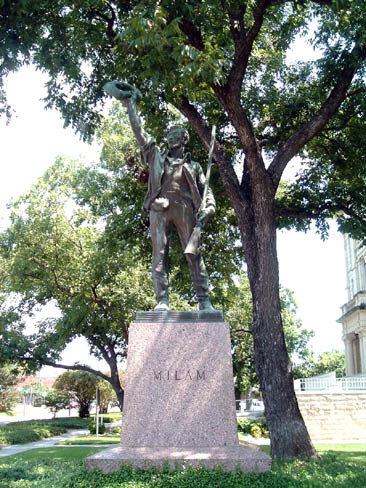 512-446-2020). 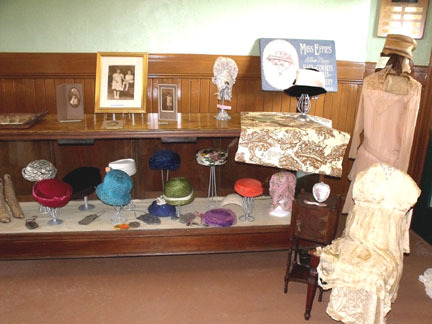 Due to the outpouring of local support, the Rockdale Historical Society proudly presented its latest display: Vintage Clothing from Rockdale's Past. Under the direction of current society president, Joyce Dalley, a spectacular display of early day clothing memorabilia was put together and the doors opened to the public. The vintage clothing display, shown during the months of March and April of 2010, brought back a flood of early day Rockdale memories and was one of the most successful historical displays to date. Artist depiction of Sign from Miss Effie's Women's Clothing Store in early-day Rockdale. Frank Dympke Letter Sweater (1938). The Rockdale I&GN Depot Museum is located in downtown Rockdale (111 N. MAIN ST.)in the recently restored former International & Great Northern Passenger Train Depot. 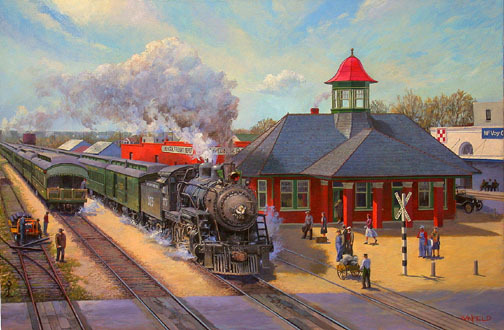 Painting of the Rockdale International & Great Northern Railroad Passenger and Freight Depots and McVoy's Grocery and Feed Store across the street. Copyright © 2009-2013. All rights reserved. No Part of this Website nor any of it's contents may be reproduced in any manner without written permission. This is a work in progress. Come back often and send me your stories and old pictures and I'll post them on the web.